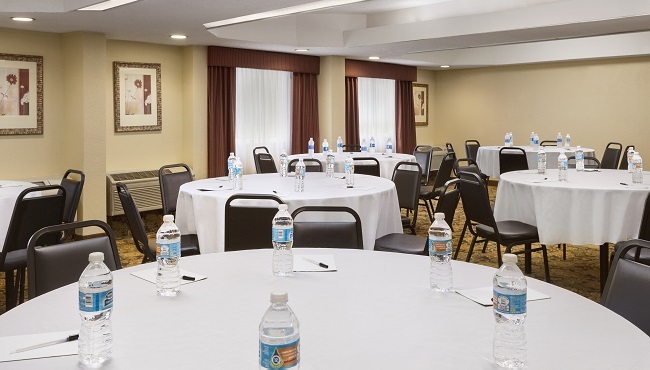 The Country Inn & Suites in College Park, GA provides two convenient event venues near the Atlanta airport, perfect for hosting upcoming business meetings or social gatherings. Reserve the smaller room for intimate get-togethers such as interviews and brainstorming sessions or the larger room for lively events of up to 50 guests. Free Wi-Fi, an LCD projector and other audiovisual equipment available on site ensure your presentation is a success. Our professional staff can help you arrange catering and create a customized Country Inn & Suites website for your event. If your attendees will be staying overnight, reserve a block of hotel rooms or suites to take advantage of group rates.